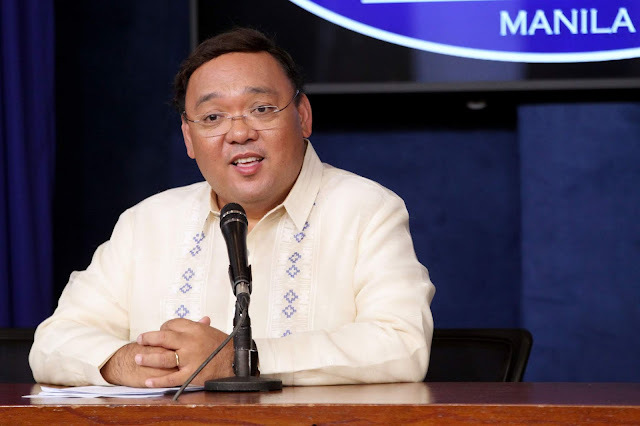 MANILA – Should he decide to run for senator in the 2019 midterm polls, Presidential Spokesperson Harry Roque on Wednesday said he wants a rank and file government executive to replace him. Roque made this remark clarifying that he is yet to make a decision about joining the Senate race since he has to consult the matter first with President Rodrigo R. Duterte. “Well, I have no decision yet, I have not talked to the President. As a presidential appointee, the first person I should talk to for whatever plans I may have should be the President,” Roque said. According to Roque, Communications Assistant Secretary for Media Relations Rachel “Queenie” Rodolfo would make a good candidate as next presidential spokesperson. “Kung ako po (If you’d ask me) someone from the rank-and-file, Assistant Secretary Queenie Rodolfo. If at all, but I’m not sure,” Roque said. “I give preference to career. Pero there’s no decision because I have to talk to the President. She’s really the only Assistant Secretary in my office. She’s the only other person who’s got a title in my office,” he added. In a separate statement, Rodolfo said she found Roque’s remark “a great honor” but preferred that he would stay in his present post. “Mere vouching from the very competent and incomparable spokesperson is a privilege in itself. It is my hope though that he stays in his present post because we need honest and effective persons like him in the government,” Rodolfo said. She, however, said she would be supportive of Roque once he decides to run for an elective post. “If and when he decides to run, I wish him all the best as we need a very good lawyer and legislator as well in Congress,” Rodolfo said. Rodolfo said as congressman, Roque is responsible for numerous bills passed into law and signed by the President, including free irrigation, free tuition in state universities and colleges, the integration of mental health in the general healthcare system. She wished Roque “good luck” and prayed that he succeeded in all his endeavors. Meanwhile, following the resignation of Communications Assistant Secretary Margaux “Mocha” Uson and her announcement that she was open to run in the 2019 mid-term elections, Roque said Uson possessed both qualifications to become senator. “The only qualification is you must be a Filipino and the age qualification so she is qualified,” Roque said, referring to the minimum age requirement of 35 years of age. During a Senate committee hearing on the PCOO budget, Uson announced her resignation saying that the Congress was purposely delaying the agency’s deliberations because of her. Uson has been under fire for posting a video on her personal blog showing Drew Olivar, her co-host in Good News Game Show, singing and dancing while making vulgar gestures to raise federalism awareness. She was further criticized for releasing another video mocking sign language but has apologized for her mistake.